A global institution, 2016 Funko Barbie Mystery Minis vinyl figures shrink the well-known character into multiple styles from her storied past. Featuring several Barbie versions from over the years, collectors will have at least 16 options to track down. The 2016 Funko Barbie Mystery Minis include specifics styles and years from the many decades of Barbie, including choices like 1959 Swimsuit, 1973 Surgeon and 1980 Afro. Individual figures are issued in a blind-box format, keeping each figure a surprise. Because cases include 12 figures, it will take multiple cases to make a full set and several figures are likely to be short prints that appear less frequently. The individual rarity is not known but will be updated if it is provided. 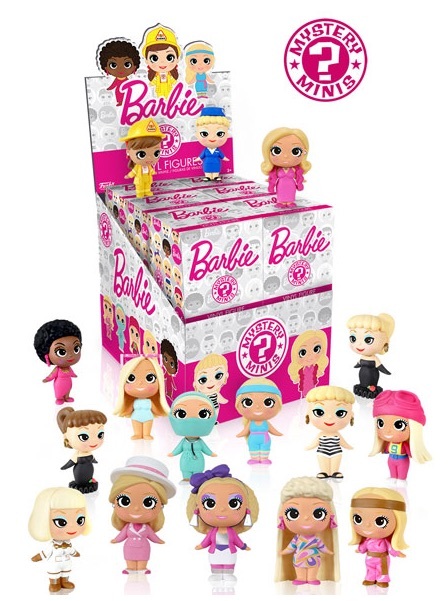 The Funko Barbie Mystery Minis are all approximately 2 1/2" tall. Full list will be added when available.